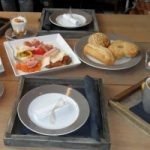 Throughout the entire region, Glückstadt is known for its great cuisine, and the original Glückstadt Matjes is known well beyond our borders. But our region also offers a wide variety of other fish specialities. That’s why the town and eight restaurateurs have joined forces and published a fish calendar. The calendar provides its readers with little anecdotes and images from the vivid history of fishing in this lovely town on the Elbe. And of course it includes an overview of the town’s seasonal fish selection. Here’s a list of seasonal fish: February to March: smelt; April to May: May plaice, Dover sole and other flatfish; as of June: Matjes (immature herring), later followed by eel; October to November: zander; and during the winter: North Sea and Baltic Sea cod. As a further treat, our restaurants serve all seasonal fish delicacies on a very special plate, the so-called Glückstädter Fischteller (Glückstadt Fish Plate). 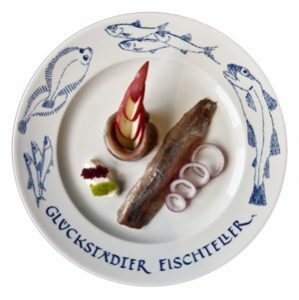 The edge of this special plate was designed by Glückstadt-based artist Marianne Gienapp as a symbol of Glückstadt’s past as a fishing centre but also of its modern maritime character. All in all, a feast for the senses.